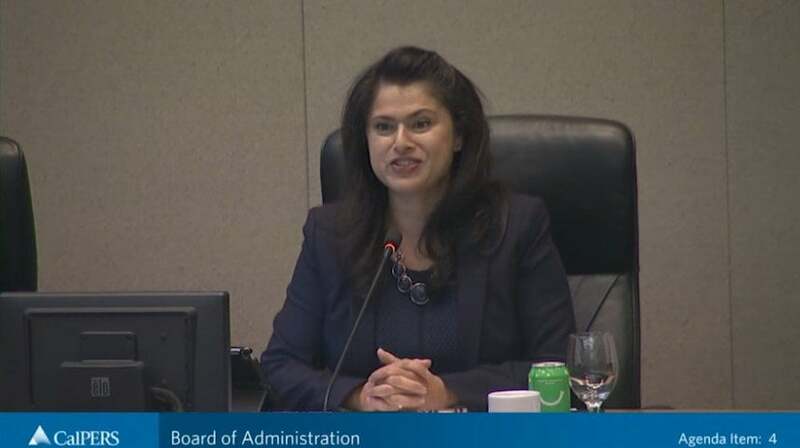 Priya Mathur’s remarks from the August 2018 CalPERS Board of Administration. I'm going to call the Board of Administration meeting to order in the first order of business roll call preem either. Good morning Rob Fechner and Margaret Brown. Steve Bora's for John Chiang. Richard Castillian Richard Guilhem Dana Hollinger here Henry Jones here David Miller here Ramon Rubalcaba. Bill Slaten. Teresa Taylor Karen Green Ross for Betty. Terrific. That brings us to our agenda item number two which is approval of the August 15th 2018 board of administration timed agenda moved byMr. Fechner and seconded by Ms Hollinger. Any discussion on the motion. Seeing none of those in favor say aye. All opposed. Motion passes. Next item on the agenda is a pledge of allegiance and for that I've asked the vice presidentMr. Fechner. To the United States of America and the outlook for which it stands one nation under God indivisible with liberty and justice for all. Genda Item 4 is the president's report and I will. Good morning everyone. I wanted to start the day by talking about dessert. Yesterday Kelleher's held our annual Ice Cream Social across the street a callipers headquarters. It's a tradition that our board members and executive team look forward to every year and we get to serve our the people who work here at callipers the callipers team by scooping ice cream and we also get a chance to chat and meet and greet that those team members. It's our way of saying thank you to everyone here and in our regional offices for all that you do throughout the year to serve our members. And it's it's a great joy to participate. So I'd like to thank my fellow board members for their participation in this year's social. And also thank you to the Cowper's team members who put on the event. I think it was a big success this year. Summer still has a way to go but this is a perfect way to take a break and celebrate the work we do together. And for once it was not a 100 degrees outside which was a great relief to all I think. Speaking of meaningful events I wanted to highlight the Cowper's benefits education events which we know is the Seabees for those who are not familiar Cowper's hosts a number of Seabees throughout the year in various cities throughout the state. They are free and open to all callipers members at any stage in their career and in fact many of the sessions are targeted to early and mid career and others to nearing retirement late career. These events are a great opportunity for members to learn more about their benefits and to attend informative classes to help them plan for their financial future. Last week we hosted one in La Jolla and we had a great turnout. In fact I think we had almost three times the number of people preregistered for this event than we had last year which is quite something. I was there and was so energizing to sit in the sessions to see how the mastery that our team has or their subject matter and also the gracious way in which they deliver it. That some some have terrific sense of humor and I really enjoyed the sessions. We also got a chance to hear Marcy speak about the work that we've been doing to strengthen the fund and I think that session was also very well-received by the members who attended. Next week on August 24th 25th and Garden Grove will be holding our last Seaby of 2018. Then of course we'll start them right back up again in January. So if you haven't had a chance to attend one yet I encourage you to go to the one next week in Garden Grove Oregon when they start up again in the new.